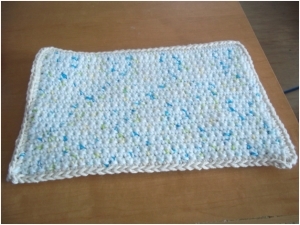 If you are just beginning your crocheting journey, a simple pattern is a Hot Pad. These work great under hot casserole dishes and pans from the oven. They are made from 100% cotton yarn, as a synthetic yarn may melt if a very hot object is placed on it. Natural fibres absorb and distribute the heat more evenly. To join rectangles, sc through both pieces around all four sides working 3 sc on each corner; fasten off. Work in loose ends. Most Hot Pads are made square, but this one is made rectangular to fit better under rectangular baking pans and casserole dishes. The nice thing about this pattern is it can be adjusted easily to accommodate any size casserole dish or baking pan. To adjust this one, simply make your foundation chain as long as you want your Hot Pad to be, then single crochet back and forth until you have the width you want. Make a second one the same size, and join the two. You will have a Hot Pad to use under the hottest of your culinary creations! This pattern also lends itself to any color combination imaginable. You can make one or more to compliment your kitchen colors or to celebrate any holiday season you wish. You may also choose to make a set for the bride and groom in their wedding colors, along with a set of dishcloths. The possibilities and color combinations are endless.